A luxurious, deep-penetrating mask which keeps heat-styled hair in top condition. Use weekly for the most amazing condition and strength. Contains UVA protection. 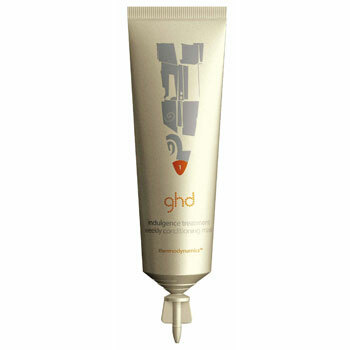 Smooth one application through clean, towel-dried hair with your palms and work through the affected areas. When it comes to styling, the heat is always on. GHDs thermodynamics 4-step range has been expertly formulated for use before, during and after heat styling, for maximum hair happiness. Aqua, Alcohol Denat, Hydroxyethylcellulose, Propylene Glycol, Polysorbate-20, Parfum, Cetrimonium Chloride, PolyDADMAC/Acrylic Acid, Penthanol, Butylene Glycol, Adipic Acid/Dimethlaminohydroxy Propyl Deithylenetriamine Copolymer Amodimethicone, Benzophenone-4, Helianthus Seed extract, Trideceth-12, Glycerin, Salvia Officinalis Leaf Extract, ASrnica Flower Extract, Chamomilla Racutita Flower Extract, Calendula Officanalis Flower Extract, Achillea Millefolium Extract, Betula Alba Leaf Extract, Methylparaben, Propylparaben, DMDM Hydantoin, Hydroxyisohexyl, 3-Cyclohexine, Hexyl Cinnamal.